We run concentrated portfolios because, in our experience, concentration works. Our portfolios have no less than 25 and no more than 35 stocks. If we own too few stocks, positions have to be supersized and the portfolio becomes too volatile, risking too much capital with each idea. If we own too many stocks, we invoke mediocrity by diluting the impact of our best ideas. A concentrated portfolio means that every stock has to earn its keep. We will not sacrifice performance on the altar of asset growth. There is a well-documented inverse correlation between asset growth and performance. To stay true to our investment mandates and to meet our performance goals, we will continue to limit assets under management. We live and die by our stock picks. We will not hug the index. With 25- to 35-stock portfolios, our clients get what they pay for — true active management. We will strive constantly to improve our investment and business practices. We are always looking for ways to be faster, better and smarter about how we invest. As investors engaged in the imperfect art of predicting the future, we want to define, through every possible means, what we have done well and what we could have done better. We will adhere to strict rules of stock selection and portfolio construction that limit downside risk. We need the backbone of discipline to deploy an investment approach that can be applied consistently in different market environments, yet is flexible enough to respond to a changing world. We can enjoy the benefits of concentration while navigating the risks that come with a best-ideas approach to investing. We will monitor every holding against a written thesis with milestones and risk factors. A paper trail documenting our investment case keeps us honest. While we do not expect our investment thesis and fundamental milestones to unfold perfectly as predicted (life has a nasty habit of getting in the way), written documentation allows us to learn from failure and replicate success. Documentation also helps us to separate process from outcome — an important distinction. We will act with the courage of our convictions, yet will change our minds quickly when the facts dictate. To be successful, we must think differently, especially when investor perceptions are based more on emotion than fact. But we must also be quick to concede that we’re wrong when the facts contradict our opinion. We invest in stocks — not opinions. We will maintain the same intensity and hunger for excess return over time. We want our tombstones to read “It was skill, not luck”. We will share profits and equity with our colleagues to foster stable results over the long term. Those who share the challenges of running our investment firm should also share in the rewards. We will be available to explain investment performance in depth. Many firms believe that the investment team should not squander their time meeting with clients. For Daruma, meeting with those who have entrusted us with a piece of their financial future redoubles our determination to put up good numbers. We consider time with clients time well spent. Daruma (dah-ROO-mah) was a fifth-century Indian monk who reached China after a perilous three-year sea voyage and became the founder of Ch’an (Zen) Buddhism. He is said to have trained the warrior monks of the Shaolin temple in Kung Fu, crossed the Yangtze River on a reed and meditated continuously for nine years (losing his arms and legs in the process). You can see why Daruma embodies resoluteness, perseverance and resilience. Many of the tenets of Zen Buddhism (separating illusion from reality, nonattachment to emotions and ideas, self-discipline and embracing impermanence) are also key to successful investing, and many of the qualities Daruma is best known for are those we seek to emulate every day. 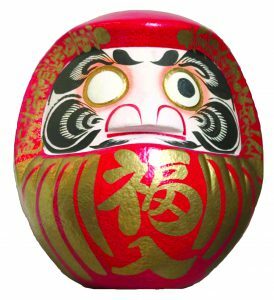 A popular form of Daruma in Japan is the papier-mâché doll, pictured here, traditionally purchased at New Year’s. The owner commits to fulfilling a goal through hard work and discipline and paints a pupil in the left eye. Once the goal is achieved, the right eye can be filled in, making the doll complete. Our firm greets each New Year with this ritual to reaffirm our goals for our clients: the relentless pursuit of superior investment performance through focus, discipline, and the separation of illusion (misperceptions) from reality (fundamentals).